As I wrote my review for The Brides of Fu Manchu, and looked at the actors who were in the film, I questioned whether any stories had been written which featured Sherlock Holmes battling Dr. Fu Manchu. It doesn’t surprise me that there has – one of them is Ten Years Beyond Baker Street, written by Cay Van Ash. Ten Years Beyond Baker Street: Sherlock Holmes Matches Wits with the Diabolical Dr. Fu Manchu (1984). The first of two authorized pastiches by Cay van Ash, Sax Rohmer’s former assistant and biographer. The novel is set in a gap in the narrative of Rohmer’s third Fu Manchu novel, The Hand of Fu Manchu (1917) and Sir Arthur Conan Doyle’s Sherlock Holmes story, His Last Bow (1917). 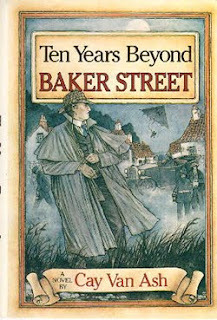 For more information on Ten Years Beyond Baker Street, check out Dr. Lawrence Knapp’s website: click here (which also has a selection of alternate book covers). Now I am going to have to go out and hunt down a copy.